Mikey had other plans on his Holy Week holiday. Driving for his grandfather was not part of it. Nor did it involve running into a very unholy secret. The story is intriguing. Mikey Recio has the typical teenage woes in a not so typical life. His eccentric grandfather makes him drive him around and makes him pray non-stop while he does so. On Holy Week, instead of taking a vacation with friends, he has to drive his grandfather to a centuries-old monastery north of Antipolo, the hills near Metro Manila. There he meets his uncle and other characters. It seems to be a reunion of sorts. There’s a secret in the air, but his grandfather continues to keep him in the dark. Unfortunately, on their way home, it explodes in their faces. Here starts the awakening of Mikey Recio to the true calling of his family and the true evil in the world. 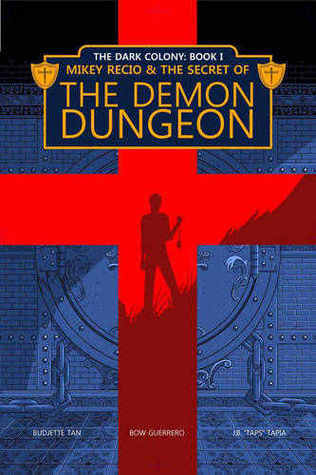 A much anticipated graphic novel, The Demon Dungeon is about good versus evil based on Catholic lore. The authors incorporate Philippine and European historical elements into the story to give it a sense of realism, adding mysticism to certain well known historical events. Origins span across the Crusades to Spanish colonization of the Philippines, the influx of Spanish missionaries into the country to build churches and spread the faith, to the arrival of US forces during the World War II, culminating in a gathering of the last members of a family in the dead of night. I love the context and the mythology used for world-building. I like the art, and the idea of a fellowship to fight against demons, as well as the medieval look and feel of combat. The idea of ancient vaults under religious structures as prisons for evil, that these must be guarded against all odds is compelling. All this said, I must say that I do have a major issue against this book. For such a world-shaking task of defending humanity against demons, the people tasked to carry out this role are sloppy, lacking foresight, disorganized, and incompetent. I know that the grandfather wishes to protect his grandson from harsh reality for as long as he can but he’s killing the boy’s joy anyway with his dictatorial and seemingly arbitrary ways. I don’t understand his logic because the smart way of keeping his grandson safe is to arm him with knowledge especially as he does drag him to the middle of danger all the time, isn’t it? And, hello, the grandson is a whiny teenager so unless he gives him good cause why he should pray aloud non-stop instead of listening to pop music the teenager is bound to get distracted—because, you know, teenagers are known to be easily distracted and occasionally rebellious. The grandfather himself falls asleep on the most dangerous part of the journey leaving an ignorant kid the only thing awake against certain death. Also, if there is a certain number of defenders necessary to stand against a certain level of demon that might at any moment show up, shouldn’t they have beefed up their recruitment, training, and retention better to anticipate any disasters that might cut down their numbers? Because, you know, the demons might actually attack every so often to mess up their operations. If demons know the location of the demon prison, what’s stopping them from making use of greedy and gullible humans to nuke the place, releasing all jailed demons in one blow? Why make it complicated when a simple solution is readily accessible? In a nutshell, my review of this volume is that it has great promise but falls flat. I hope the next volume will be more solid in terms of plotting, and will prefer logical actions over senseless heroism. *Trese is a character in a graphic novel series, also called Trese. She’s a paranormal investigator consulting with the police. She’s based in Manila but will travel to the provinces if a case calls for it. Read my reviews of this series by clicking this link. ← The Sirens of Titan by Kurt Vonnegut, Jr.